Thursday 24 July 2014 - our afternoon of training followed by our test run. 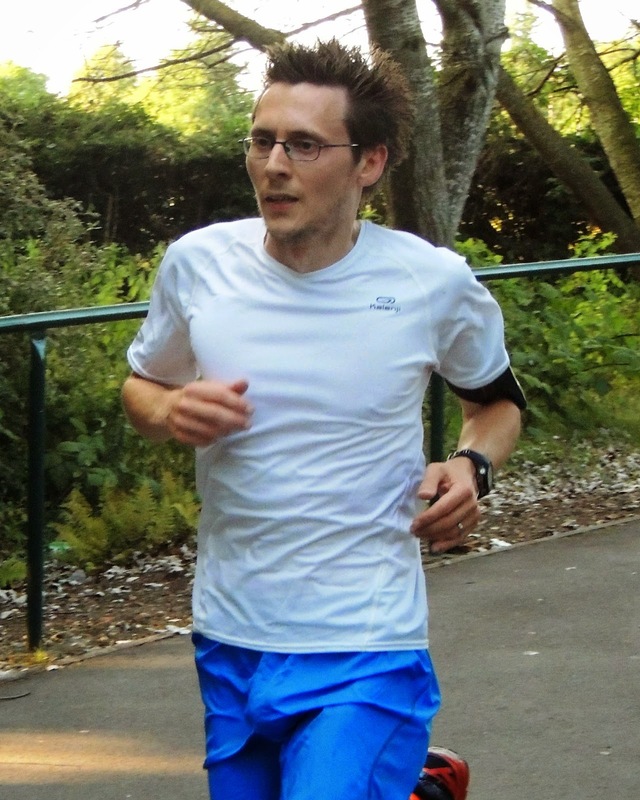 Related: my 'Dartford parkrun course description' blog. The training took place in the afternoon and was attended by myself, Richey, Tessa, Jonathan (Shorne Woods parkrun), and Jacky (Whitstable parkrun). Jacky lead the training session and really was amazing - everything was explained in detail and we left feeling in much better shape for the test run, which was scheduled for 7pm that evening. When we arrived in the park to start getting ready, there was already a small gathering of parkrunners waiting at the start area. Good news - we definitely had some runners. And. They had found the start area! I also spotted a really good contingent of runners from our running club, So Let's Go Running. It was great to see them here supporting us. The President of Dartford Harriers, Tony Durey, had also got a few his runners to run. To complete the Dartford running club set, I also spotted a few Dartford Road Runners out to test the course. There were also some parkrun club shirts on show and a good turnout of Shorne Woods and Bexley parkrun. Thank you to all of you for your support. At the test run, we were all going to take on the roles that we would at our inaugural event. For me, that involves helping to get the course set up - running the 5k - then quickly slipping into my volunteering vest to scan runners' barcodes after their runs. So I got to work putting out the course signage. It was the first time doing this so it took longer than it will once we fine tune things. I had to spend a little time making holes in the signs so they could by attached to benches and flag poles, and hung from trees and bushes. I also put out a few cones where they are required. Once I was happy with the positioning of them I headed back to towards the start. By now we were running late and I could see the runners gathered at the start area. But then the air horn went off and they all started running. It had started without me!! I continued my jog back to the start area, slipped out of my volunteering jacket, searched for some satellites, then got a move on to catch up with the rest of the runners. You see, in order for me to run and barcode scan, I have to finish fairly close to the front of the pack. I caught up with the tail runner, Ben, about a minute or so later then proceeded to filter through the rest of the field. Once we had completed the off-road section I had settled into a fairly decent place within the field - there were plenty of runners behind me that I could scan at the end. I followed the course around - looking out for things that could be improved. I was glad to see the runners ahead of me easily following my signs and not getting lost. At the start of lap two we have an additional section 'Mick Jagger's Leg' which gives us the extra few hundred of metres we need to make up the full 5k. The end of the section involves a loop around the monument of Mick Jagger. However, a couple of runners missed the looping point and I had to chase after them as they disappeared into the tunnel that goes under Princes Road into the Brooklands Lake area. This was a useful lesson to learn and we were lucky that I had been exactly where I was. I now know that an additional sign plus the marshal is needed here - so that'll be in place for event 1. I continued around the rest of the course - The marshals all seemed to be positioned perfectly and I didn't spot anyone else losing their way. 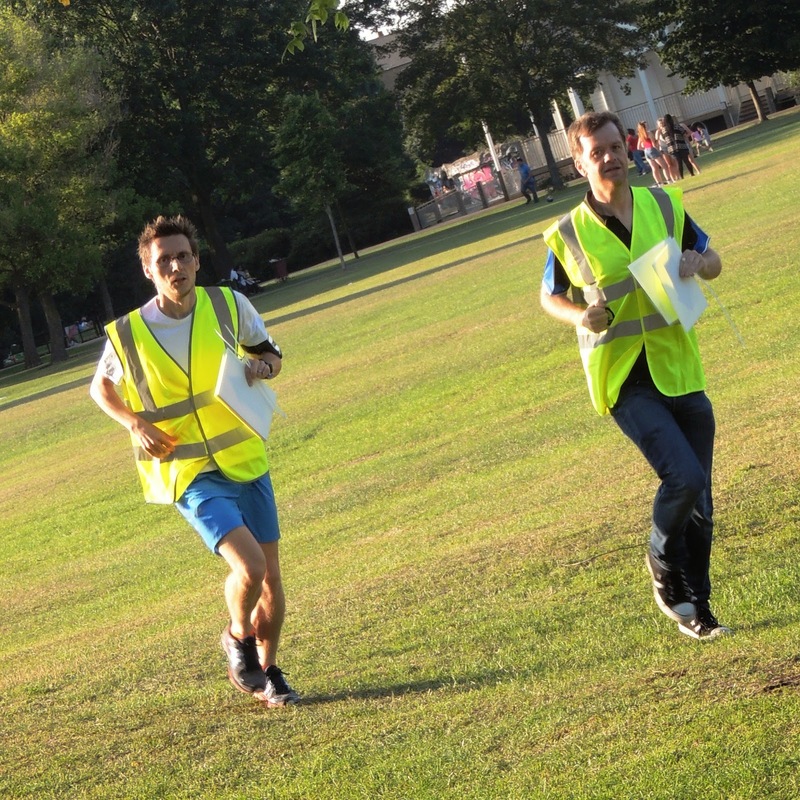 Once I had finished, I quickly pulled on my volunteering vest and got into position to scan runners. I wasn't the only barcode scanner on duty, so the first few runners had been able to have their barcodes scanned. There were now two of us in position to scan the rest of the field. The feedback from the test event was very positive. There were a few points about some overgrown parts of the trail section, so we'll have a look into that. No doubt we will learn more over the next few weeks and months, but all the runners made it around and everyone I spoke to said they enjoyed the course. Thank you to all of the volunteers and runners that came along to help us practice. We couldn't have done it without you all! 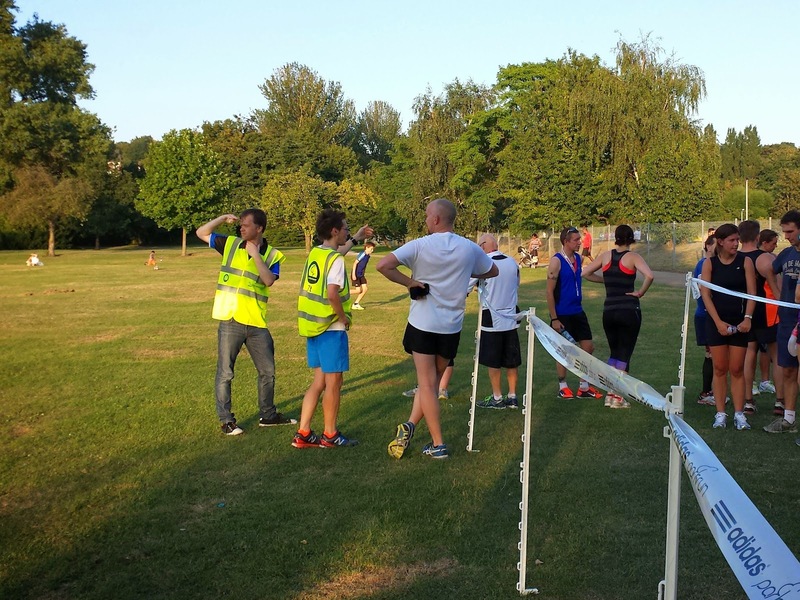 The unofficial results are on the Dartford parkrun news page.